Now that the iPhone 6 and iPhone 6 Plus are about to hit the stores, the two phones have undergone the Geekbench test suite. The popular benchmark stresses the phone's CPU and RAM by going through numerous tests to determine the final single-core and multi-core scores. The results are quite interesting. The iPhone 6 trumps the iPhone 6 Plus in both single-core and multi-core performance. 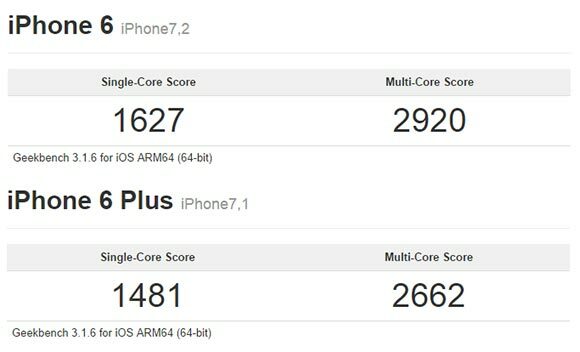 The iPhone 6 scores are 1627 and 2920 points versus iPhone 6 Plus' 1481 and 2662 points for the single-core and multi-core results, respectively. Digging a bit deeper we can get a better idea of why this is so, considering both are rocking the same Apple A8 chipset with a dual-core CPU. The processor in the iPhone 6 is clocked at 1.39GHz, while the one in its bigger brother runs at 70MHz lower speed, at 1.32GHz. There's a difference in the RAM capacity as well, however minuscule it might be. The reported RAM memory for the iPhone 6 is 987MB, while the iPhone 6 Plus makes do with 975MB. These minor differences in the CPU and RAM specifications aren't enough to justify the large gap in the test scores. One possible explanation is that the Geekbench suite itself isn't yet optimized for the Apple A8 architecture and has slight variations in its results. Just yesterday another popular benchmark suite Benchmark pulled off any test results done on the Apple A8 chip until it sorts known bugs with its software. It also depends on your phone's customisations. My previous phone was a Coolpad note 3 lite and the benchmark result was 38k after using the phone for 18months. This is apparently much higher than the score given to your average same model..